• Inkjet cartridge for Epson printers. • Suitable for: Stylus S20/S21/SX100/SX105/SX110/SX115/SX200/SX205/SX210/ SX400/SX405/SX410/SX415/Stylus Office BX300F. The ink that you put into your printer is just as important as the machine itself if you want to guarantee quality results. Epson is an expert at designing machines and cartridges that work together in harmony to provide you with the very best results. 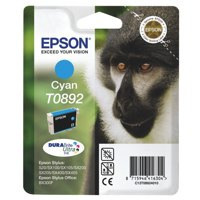 The T0892 Cyan Inkjet Cartridge is purposefully designed to be expressive, meaning that you can achieve a wide variety of results without hassle or trouble. Whether you want strong, powerful tones or subtler shades, you can be sure that this cartridge will comply.